Do You Struggle Finding The Right Words? 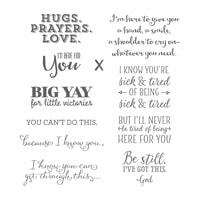 One of the hardest things for me is finding just the right words to put a cards for certain people. Seems like I never have just the right stamp to use. 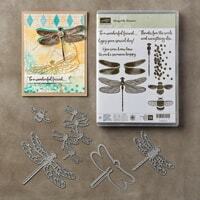 One stamp set that I have used a ton is SENDING THOUGHTS in the Occasions Catalog. It’s been perfect for so many cards I have had to send recently. Here are 2 cards that I recently made for some special people. If you like these greetings, they will be retiring and only guaranteed available through May 22nd. So order soon if you want! 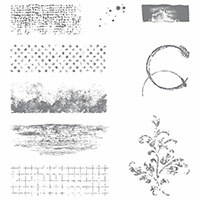 Below are the stamp sets used in today’s cards. Click on any of the pictures to go to the online store to order. NOTE: Dragonfly Dreams & Thinlits WILL BE in the next catalog, however, they will not be bundled to get the 10% discount! Order before May 31st to get the discount! Also–SENDING THOUGHTS will be retiring. Order my May 22nd to guarantee availability. Wondering how I made the background? I recently posted this card, along with a video tutorial for quick and easy collage backgrounds.